Summary: This project will improve our visitor education by creating hands-on educational exhibits in our exhibit hall. These exhibits will further community awareness about the global distribution of sea turtles, threats facing turtle populations, and what citizens can do to help sea turtles. Visitors will have the opportunity to interact with these exhibits as well as with volunteer docents interpreting biofacts (sea turtle models, replica skulls, x-rays, sea turtle food items, predators) to further engage our visitors in the conservation experience. We also seek to enhance our outreach programs when groups are not able to visit the center. The funding requested is for the development, construction, and installation of a sea-turtle-global distribution exhibit and a threats-and-solutions exhibit, coordinating exhibit signage, docent and outreach biofacts, and outreach program presentation supplies (laptop, lcd projector, a travel case for the biofacts, portable projection screen). Results: The final educational signage, including the Sea Turtle Grants program acknowledgment was installed by April. 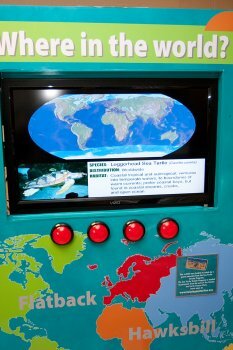 The sea turtle distribution map exhibit is up and running. We purchased replica green, hawksbill, leatherback, and loggerhead skulls to enhance our existing biofact collection. We purchased a laptop computer, PowerPoint projector, replacement bulb, travel projection screen and protective cases to perform our outreach programs. A pelican case was purchased as well to store and tote our outreach program biofact props. We now have a travel education kit that is easy to load in a vehicle and be completely operational without having to rely on the host site for any items except electricity.